Trường THPT Yên Lạc tỉnh Vĩnh Phúc tổ chức thi thử nhiều lần trong năm. Đây là hoạt động tốt nhằm giúp học sinh thpt của trường nói riêng và sĩ tử ớp 12 nói chung có nguồn đề thi chất lượng với nhiều dạng câu hỏi, bài tập các chuyên đề trọng tâm phong phú luyện tập. Với đề thi thử lần 1 trong năm 2017 này của trường, môn tiếng Anh cấu trúc 50 câu trắc nghiệm có đáp án. 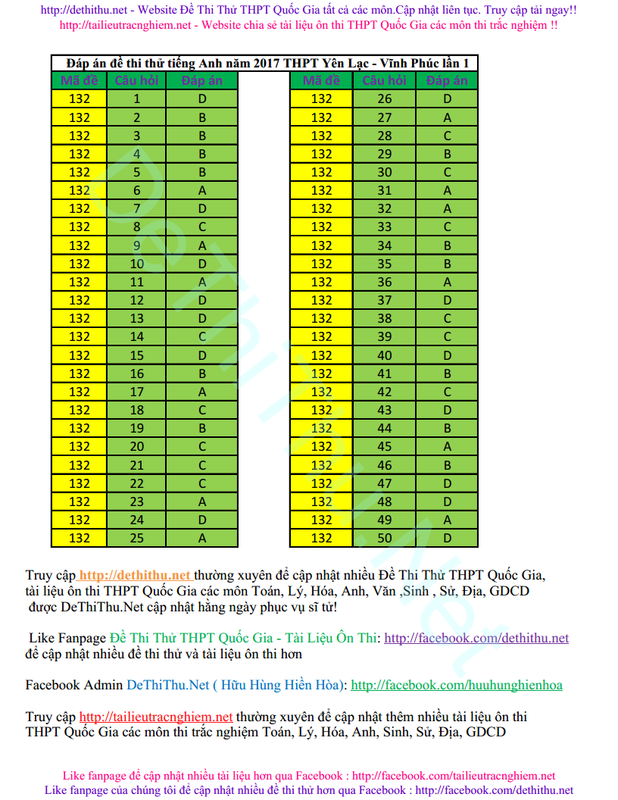 Tải file PDF đầy đủ ở cuối bài viết để in ra hoặc xem trên điện thoại, máy tính. Question 1: Choose the option which has the CLOSEST meaning to the underlined. My wife was so keen on the picture that she paid through her nose for it. Question 2: Choose the option which has the OPPOSITE meaning to the underlined. People in Vietnam nod their head to show that they agree with something. Question 3: Choose the option which has the CLOSEST meaning to the underlined. My hard-working students expected a good fortune to come in addition to their intelligence. Question 4: Choose the option which has the OPPOSITE meaning to the underlined. It’s difficult to tell him to give in because he is so big-headed. Find the underlined words or phrases which is incorrect. Question 5: An increased number of city dwellers has made the obsolete infrastructure worse and required a lot of repairs in these days. Question 6: The elderly are concerning about the city’s hygienic conditions, natural resource, and elite class. Question 7: In conclusion, plenty of money should, to sum up, be invested to repair the kilometer-long tube in near future. Question 8: It is not until the sun is shining brightly that the little girl woke up. A. No sooner is the sun shining brightly than the little girl woke up. B. Not until the little girl woke up is the sun shining brightly. C. Not until the sun is shining brightly did the little girl wake up. D. As soon as the little girl woke up, the sun hasn’t shone brightly yet. Question 9: “What language do you find the most difficult to learn of all?” Nhung asked Ha. A. Nhung asked Ha what language Ha found the most difficult to learn of all. B. Nhung wanted to know what language they founded the most difficult to learn of all. C. Nhung asked Ha what language did you find the most difficult to learn of all. D. Nhung asked Ha what language you found the most difficult to learn of all. Question 10: They reported that the teachers expected more. A. The teachers were reported to have been expected of more. B. The teachers were expected more. C. The teachers were reported to have expected more. D. The teachers were reported to expect more. Complete the sentences with the given options. Question 15: John proposed _______ Mary on a fine day at the crowded beach in their hometown. Question 16: He said he hadn’t finished his letter yet ________. Question 18: Her mother’s dream _______ a family doctor will be fulfilled in six years. Question 19: They ________ their service up to now. Read the text and answer the questions given by choosing one numbered options. If you want to give someone the nod in Bulgaria, you have to nod your head to say “no” and shake it to say “yes” – the exact opposite of what we do! In Belgium, pointing with your index finger or snapping your fingers at someone is very rude. In Japan, you should not blow your nose in public, but you can burp at the end of a meal to show that you have enjoyed it. The ‘OK’ sign (thumb and index finger forming a circle) means “everything is good” in the West, but in China it means nothing or zero. In Japan, it means money, and in the Middle East, it is a rude gesture. Question 46: In the Middle East, people do not use their left hands for eating because they use their left hands________. Question 47: It is mentioned in the passage that many gestures __________. Question 48: Which of the following is NOT true according to the passage? A. In Belgium, snapping your fingers at someone is very rude. B .In France, people shouldn’t rest their feet on tables. Question 49: The word “others” in paragraph 3 refers to __________. Question 50: People nod their head to say no in __________.